Weave-It Looms™ were not the first, but they certainly were the most popular of the hand-held looms. The designer, Donald R. Simonds, filed his patent for the unique pin arrangement in October, 1934. The looms were then produced and marketed by several different companies over the next forty years. The appeal of Weave-It’s patented 3-pin arrangement is that it helps the weaver warp and weave quickly without making errors! 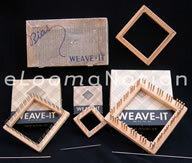 Weave-It Looms™ were available in four main types: 4” square, 2” square, 5” rug loom and the 4” bias loom. The 4” and 2” were first made in wood and later in plastic. (The 4” was also made in Catalin for a brief time.) The bias loom was made of wood with metal pins. The rug loom was wood, with wood “pins”. My favorite of all hand-held looms is the 5” Weave-It Rug Loom on which I can weave with bulky handspun yarns, fabric strips, raffia, ribbon, etc. Squares made with this loom take no time at all and are quickly assembled. If you're handy, here's a site that will help you make your own loom: http://www.rogersstark.com/wool/weave/weave.htm. Weave-It standard 4” and 2” looms in plastic are what I use the most—easy to carry, easy to replace if lost or broken (eBay), and easiest to use. The plastic versions of these looms have pins with smooth, rounded tips and that makes a difference to your fingers when weaving hundreds of squares. The De Luxe Catalin 4” looms are beautiful and warm to touch, but fragile. These came in a sweet little box–called “airplane luggage”. The Weave-It Bias Loom™ is the rarest version. It’s a 4” wood square with evenly-spaced pins (including corner pins). Woven squares have their straight grain on the diagonal, from corner to corner, with bias edges. Apparently it was never a big hit with Weave-It users. Scovill/Hero finished the line in 1972 with an Adjustable Giant Size Weave-It™, which accommodates either worsted weight or rug yarn. 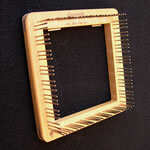 This loom is adjustable from 2" to 12" squares or rectangles and may be used exactly like the standard Weave-It. Loomette King Loomette™ looms were introduced in 1935 and were almost identical to Weave-It standard looms, including Weave-It's signature pin arrangement. The manufacturer of Weave-It obviously did not take this sitting down—by 1936, Loomette pins were evenly spaced. At the same time, they added a nifty improvement: moveable metal bars with pins that allow you to divide the loom in order to weave smaller rectangles. Many sizes are possible with the two inserts. This innovation, along with their pattern support, makes the Loomette loom and publications worth acquiring. Magic Loom® was Bucilla’s contribution to the hand-held loom craze. (Not to be confused with Bucilla Magic Looms that are metal, come in a set of three, and are for constructing yarn flowers.) This one is molded ivory plastic and has an adjustable bar insert, like Loomette. The pins are raised in relief on the sides of the loom, with two short, one long, making it easy to maintain correct warping and weaving. Magic Loom® has an equal number of pins on each side and the resulting square is a tiny bit larger than it would be on the Weave-It Standard loom. The patterned weaves can be balanced and symmetrical, something that is often not possible with Weave-It. Jiffy-Loom with adjustable bar Jiffy-Looms have wood frames and a slot in each side, which holds a toothed fiberboard insert. I have nothing good to say about these, as the inserts have a nasty tendency to pop out of their slots, or bend, or break, as soon as you get the teeth wrapped. OK, I’ll allow that it did come in many sizes and there were some interesting published patterns. Easiweave Looms Easiweave looms were around before Weave-Its. The earliest looms had carved slots in the wood frame to hold the yarn. Later versions had metal pins instead of slots. Both versions were made with sides that were held together with thumb screws, so you could take them apart. Dubble Weeve has a system that raises the teeth on one side of the loom, like a loom harness. Lightning Weaver has a mechanism for turning the warp from side to side, which creates a “shed” for the easy insertion of the needle carrying weft thread. This loom has metal teeth and can be adjusted to make 12 different sizes of rectangles and squares, from 3” x 2”— 6” x 4”. A little too big and heavy to hold in your hand, it will rest in your lap or on a table. I LIKE this one a lot. Once you get the hang of it, the weaving process is pretty fast. Wrapping the warp all at once allows you to weave with a variety of traditional techniques, like inlay and clasped weft. Whiting and Straits metal looms appear at first to be ordinary potholder looms. Two things make them stand out from the crowd—pins close to the corners (helpful for a continuous weave) and modular pieces that allow the loom to be adjusted for a smaller size or even joined with another loom for a larger size. Very useful. Davis Loom Davis Loom has two interlocking metal pieces and is adjustable to two sizes—3” and 4”. It can be easily bent out of shape and has an annoying tendency to come apart at inopportune moments. I want to like this loom, but there are just too many problems. Weave Easy and Wonder Weave looms are tiny plastic rigid heddle looms. Hooks at top and bottom hold the wrapped warp and the weaver makes a shed with a knob that operates the heddle. Metal bars on each side function like a temple, preventing the woven piece from cinching in on the sides. The metal bars are adjustable, for smaller rectangles. The biggest drawback that I found is that the loom frames are made of four pieces joined at corners and there is nothing to stabilize the corners. Looms won’t stay square as you use them. I’ll pass. Pucki size, compared to standard Weave-It Were hand-held looms purely an American phenomenon? Obviously not! The Pucki loom information was sent to me by Angy in Germany. She thinks it was probably made in the 50's and promises to follow up with more details when she gets a chance to sample the loom. The Auto-Weave Loom from January & Wood Co. of Maysville, Kentucky is a sorry excuse for a handheld loom. While the rotating hook part works just like the much better conceived Lightning Weaver, the designer did not add an element to the loom sides to tension the weft. All squares made on this loom are likely to be wasp-waisted. That’s if you can get through the weaving at all without popping it off the bottom uprights, which are totally smooth and have no curve or hook to prevent warp threads from flying off. Grrr! It’s here only to serve as a warning. However…the manual has a couple of interesting ideas for joining squares together that I haven’t seen elsewhere. Simplex Hand Loom There seems to be no end of 4” looms manufactured in the United States. The Simplex Hand Loom was made by F. B. Gustafson of Rockford, Illinois. The only thing that distinguishes it from the Loomette is a minor variation in the yarn-wrapping sequence. Le Tissor is a tiny (1.5" finished square) French loom that works like the Lightning Weaver. The rotating hooks at one end of the warp make a shed. There is a clever little mechanism on the back that pulls down the warp prongs at the other end, making it very easy to release the finished square. The instructions are in French, but its mechanism is pretty obvious. Another category of handheld looms might be more accurately called reweaving or darning looms. Back in the day when people repaired their clothing and textiles, rather than pitch them in the landfill, there was a big demand for skilled reweavers, who were often associated with tailoring shops. (If you are able to find a reweaver today, be prepared to pay at least $50 for a small repair.) When a damaged area needed a patch and there wasn't enough spare cloth available from the hem or a facing, the reweaver could weave it from scratch, pulling threads from the seams and hems. Threads surrounding the patch would then be woven into the original cloth as invisibly as possible. Some of these looms are very elegant and clever and some are crude, as you can see here. The Nu-Weaving loom (4" x 6") was packaged with a 45 page "Extension Course in Nuweaving", a reweaving needle, a little cardboard triangle that helped to estimate yarn sett and a suggested price list. After completion of the course and submission of samples, the buyer was to received a Certificate of Competence, a 3-color Oil Painted Display Sign and Two Extra Sized Needles. For $35, plus COD shipping. And this was in 1952! It would be interesting to find out if anyone starting with this course went on to launch a reweaving business. ©eLoomaNation 2005-2019. All rights reserved. Reproduction Prohibited.